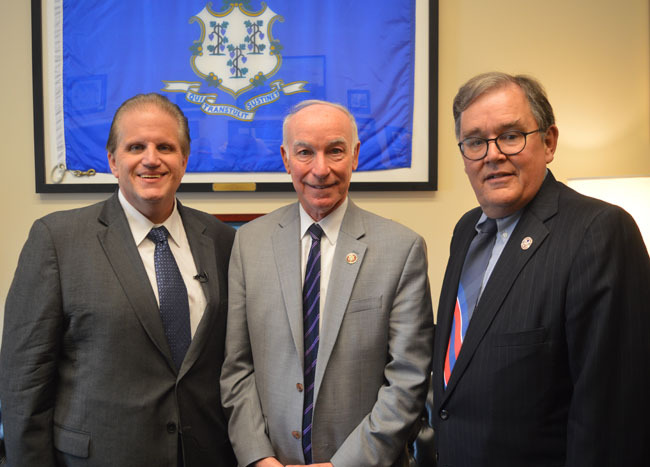 Metal Trades Dept Pres James Hart (left) and MTD Exec Sec/Treas Daniel Duncan (right) thank US Rep. Joe Courtney (D-CT) for his support of the Jones Act. Courtney is the chair of the House Armed Services Committee’s Seapower and Projection Forces Subcommittee. Support for the Jones Act continues to come from around the country and on Capitol Hill. On April 9, MTD Executive Secretary-Treasurer Daniel Duncan and Executive Board Member Brett McCoy took part in the annual AFL-CIO Metal Trades Department lobby day in Washington. Approximately 50 union members (including some from MTD-affiliated Boilermakers, Electrical Workers, Operating Engineers, Iron Workers, Machinists, SMART and United Association) met with U.S. Senators, Representatives and their staff regarding the Jones Act, the Philadelphia Shipyard and federal workers’ pay and pensions. Speaking at a press conference prior to the lobbying effort, Metal Trades President James Hart declared support for the Jones Act is vital in the fight to keep the unionized Philadelphia Shipyard open. The facility employs less than 150 people after having as many as 1,200 at one time building new U.S.-flag vessels. A week before, U.S. Coast Guard Commandant Adm. Karl Schultz told the House Appropriations Homeland Security Subcommittee, “The Jones Act is important to the security of the nation, the merchant fleet here, and our ability to move military supplies and military out loads. 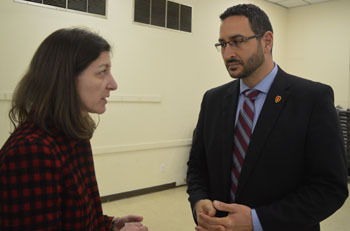 US Rep Elaine Luria (D-VA) discusses maritime issues with Hampton Roads PMC member and Iron Workers Local 79 Business Agent Tommy Bell during a meeting in Norfolk last month. Late last month, industry and labor created the Florida Maritime Partnership, which announced the findings of PricewaterhouseCoopers research showing the Sunshine State ranks second in the nation for domestic maritime jobs, employing nearly 66,000 people while generating $3.7 billion in worker income. Florida Congressional members from both parties expressed their support. S. Representative Charlie Crist (D-FL): “The importance of the maritime industry to both Florida and the United States cannot be overstated. A robust maritime industry means a strong economy, good jobs and enhanced national security. S. Representative Vern Buchanan (R-FL): “Florida has an incredible opportunity to grow its maritime industry to help diversify the economy, create jobs, and move goods and services. Posted on March 30, the Florida Times-Union wrote, “Kudos to Rep. John Rutherford for supporting the continuation of the Jones Act. The Jones Act, part of the 1920 Merchant Marine Act, states that cargo moved from one domestic port to another domestic port must be carried by U.S.-crewed, U.S.-built, U.S.-owned and U.S.-flag vessels. It is the nation’s freight cabotage law. A study conducted by the London-based Seafarers’ Rights International and released last year by the International Transport Workers’ Federation revealed 91 countries have some type of cabotage laws on their books.